Due to its function, personal watercraft is often subject to the elements. 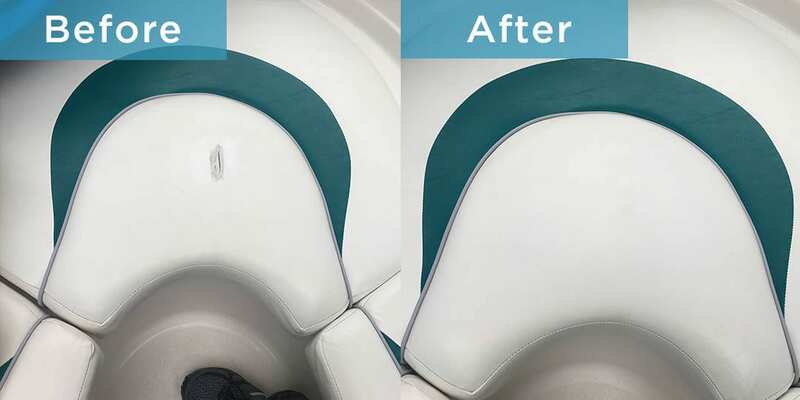 When vinyl seats and dashes are damaged, it puts your boat at high risk of water damage. A little tear in a seat can quickly make way for the whole area to be rotted through, which is costly and difficult to fix. Boat carpet is vulnerable to water damage in the same way, and damage can quickly spread. With New Creations, damage like this can be repaired before it even happens in order to save you time, money, and headache. Unlike a vehicle, a boat’s interior is uncovered when in use, leaving it directly in the sun. It sometimes seems inevitable for your beautiful boat to look worn and faded due to the sun, but New Creations can restore your boat for an affordable price. At New Creations, it is our goal to provide outstanding quality, durability, and convenient mobile service to ultimately bring the highest value to our customers. Our mobile technicians will come to your home or dock to save you time, hassle, and remove the risk of transport damage. With New Creations, your boat will look pristine for an affordable price and at little inconvenience to you. Repairing the damage right away saves time and money, and using a boat that looks great will make you feel great as well. From a ripped carpet or seat to a scratched dash, New Creations will make your boat look like new!